Hunting tree rats from a boat is a great idea! Squirrels like to live and eat near water. If there is a body of water in the place you plan to hunt, this may be an option. Floating down a stream can be silent. Taking a canoe, Jon-boat or even a large inner tube will help you to travel over a large area in record time. The advantage to having two in a boat is fairly obvious. One tends to the boat while another watches for squirrels. Often, the two take turns navigating the boat; after one shot, that person guides the boat and the other person has a shot. This is a logical choice; if you recall when discussing squirrel varieties, I mentioned that tree rats prefer to live in and around forests — close to water. Another reason this is a great choice, depending on the age of the youngster with you, he/she may get tired of stalking fairly early. Fighting off starvation any way he can! When I read about this style, I was stunned by the cleverness of it! I’ve made a big to-do about dry, crisp leaves and childrens’ difficulty traveling over them. In my travels over the South during the past couple of years, I’ve been shocked by the arid, desert-like conditions. Georgia and Texas have been particularly hit by drought. In The Ultimate Guide to Small Game and Varmint Hunting, by H. Lea Lawrence, he suggests that you use a topographical map to find any railroad tracks (in your hunt area)! The railroad companies keep their track easements clear. It is much easier to travel on tracks than on ground littered with twigs and brush. Mr. Lawrence makes a point about abandoned tracks, too. Generally, these are also cleared and would make good trails through woods. As soon as you see a likely spot, veer off the tracks and get started stalking or sitting. Next part: In a few days,when I return to this subject, I’ll give a list of things to consider taking on your next squirrel hunting trip. Over the course of this series of articles, I’m going to discuss 3 types of squirrel hunting. Only you can decide which method fits the age and experience level of the youngster you are mentoring. Of course, weather and hunting conditions will also affect your choice. Stalking is the most common type of squirrel hunting. If your pupil has learned the basic parts of keeping silent, moving slowly and learning to watch for squirrels (see Part 1 for more info), then this type of hunting puts all of that into practice. Because kids have a hard time staying still, stalking helps them work off their extra energy. Discussing the type of ground that you will walk over will be important. Few kids understand the difficulty of traveling quietly over dry, crisp leaves. If the area you are hunting is parched dry, sitting down and waiting for squirrels may be the best idea. If you have an opportunity to “scope out” the area before the day you will be hunting, it helps to find places where squirrels have been feeding. Then you can find likely hiding places or sitting positions. By clearing noise producers (dry leaves and twigs) out of your hiding/sitting places, it will make things easier when you are trying to move around in the dark before dawn. Squirrels are like kids — they like to be out on calm days. They don’t seem to be troubled by sun, clouds or light rain. However, windy days or turbulent weather helps squirrels decide to hunker-down in their nests or tree holes. Stalking is more difficult when the leaves are on the ground. Squirrels are noted for their keen eyesight. With no leaves to hide you, squirrels will probably see you long before you catch sight of them. Each state sets its own dates for hunting squirrel. Unlike turkey hunting season, squirrel season has nothing to do with breeding. This is because squirrels reproduce throughout the year, rather than in one season. Some states have spring and fall squirrel season, some have just hunting in the fall and a few states have year-round hunting. Next time: Hunting squirrels on water … and more! In the Fall, Squirrels Move to Trees With Nuts! Kids need to complete a hunter education course before being given a gun. You will find that you really enjoy teaching youngsters how to hunt squirrels (or anything else). It’s an opportunity to continue an American tradition. I can’t tell you how many reluctant “hunting-lore teachers” dread the experience (before the fact) and beam with pleasure after the experience. It’s your opportunity to share your love of hunting with the next generation. If kids learn these skills before the day of the hunt, it will be more enjoyable for all. Next time: 3 types of squirrel hunting; equipment needed and more! The southern flying squirrels are strictly night eaters (of berries, insects, nuts, fungi). Terribly shy, they reside in tree holes in hardwood forests. They glide, rather than fly. They range in all of the eastern US (except New England and the lower tip of Florida), as far west as Minnesota, eastern Kansas and Texas. Ditto for the northern flying squirrel, except that they live in Alaska, Canada, California, Montana, Wyoming, Utah, Idaho and spreading to the east as far as New England and the Appalachians. Flying squirrels have an average lifespan of about 6 years in the wild; in captivity, they last more than twice as long! Unfortunately, a variety of predators feast on these rare squirrels (rare in comparison to the other subspecies of squirrels). Coyotes, snakes, night owls, raccoons, and even the domestic cat prey on these small animals. same habitat as the grays: cypress swamps, hardwoods, urban areas, thin tree stands near rivers or streams. 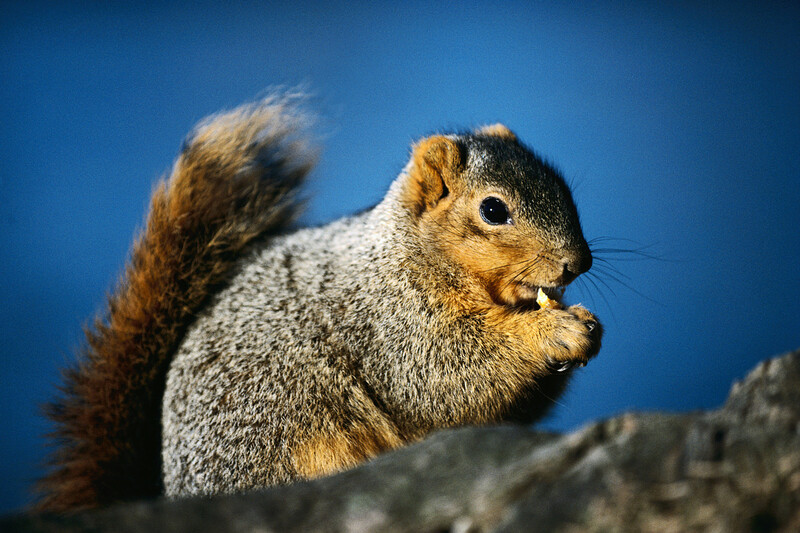 The fox squirrels eat a wider range of things: nuts, bird eggs,Long, Lean & Mean! berries, seeds, fungi, buds and the inner bark of maple trees. Like the grays, they love corn and are the bane of cornfields. Because they are large, they must spend more time feeding and rove a larger area from their nests. Interestingly, they travel on the ground, more than in the trees. 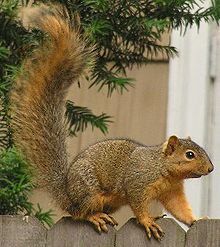 This popular hunting squirrel lives in Washington through California, usually in redwood or hardwood forests. Their nests are made of shredded bark, up high in trees. In the winter, they do as their cousins, find a tree cavity or hole. 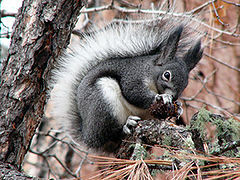 Feasting on bird eggs, insects, acorns, pine nuts, fungi and fruits, this squirrel has a notably sharper sense of smell. He also had an excellent memory and he does remember where he buried the nuts! This variety sticks to inland forests. There are 9 Subspecies of this Rare Squirrel! Utah and New Mexico – home. He builds his nests in the ponderosa forests (in the crotches of trees) with leaves and shredded bark. Abert’s eat pine seeds, pinion nuts, fungi, berries, dropped antlers and weedy plants. There is a sub-species of Abert’s, called the Kaibab Squirrel. It lives only on the northern rim of the Grand Canyon and is considered ENDANGERED. These are all names for the same tree rat, that inhabits hardwood and mixed forests and conifer forest areas. They range from Alaska, Canada, along the Appalachian & Rocky Mountain areas, to as far south as Wisconsin, Illinois, Iowa, Minnesota and Ohio. BTW, the Douglas Squirrel is a twin of the red. The only thing different about this rodent is that this one has a wide range of calls. He seems to use all of them when hunters are about – looking for other game. He’s not a hunter’s friend! Douglas squirrels live on pine seeds and the rest of the tree rat diet and hang out in British Columbia, and the western states of Washington, Oregon and California. Next Time: Finish the northern and southern flying squirrels and on to hunting squirrels with kids. Helping Youngsters Learn to Hunt Squirrels! From personal experience, I know that squirrels come from far and wide to hang their “Home, Sweet Home” sign in trees with nuts. When Hurricane Ike blew through here last September, MDH’s* pecan crop lay littered over the ground. Would the squirrels eat them? Nope, they wanted fresh ones – and stripped the trees of the remaining pecans. I think we are sending a confused message about these rodents. Where we live, squirrels can be shot year round. However, in Houston (a mere 35 miles away), squirrels are protected! If you are trying to help a youngster get started hunting, squirrels might be just the right target. The skills a young person develops hunting these creatures carries over to larger game. For example, squirrels are wary and have sharp ears and eyes. Learning to travel in the woods, searching for these tree rats is great training for hunting wild turkeys, etc. 63 Species – From 2 Ozs. to 20 Lbs. There are an incredible 63 species in this group, from mini-chipmunks to huge marmots (up to 20 lbs.). Today and tomorrow, I’ll offer info about some of the most common tree squirrels, what they eat, etc. ; then come back and discuss hunting methods with kids. Probably the most common ‘shade tail’ in America, they live wherever nuts are grown. Grays also love corn and can decimate cornfields throughout the growing season! Everyone knows the ‘old wives’ tale’ that squirrels remember where they bury their nuts. Not so, say biologists. Instead, they use their incredible sense of smell to find them when food is scarce. Where winters are harsh, grays move into holes (created by disease or woodpeckers). When the weather warms, they tend to build nests in the crooks/forks of limbs. When there is enough food, grays prefer to eat in early am and late afternoon. In times of want, they must feed all day to get enough. What is less known is that these animals like to feed on tree buds in the moonlight (during the spring season). Grays range over the largest area – Manitoba, all of the eastern states, Iowa, and eastern North Dakota, Oklahoma, Texas and Kansas. They also live in the widest range of habitats: swamps, hardwood forests, piney woods, and cleared areas with thin tree stands along rivers, thickets and urban areas. Next: Other tree squirrels: fox squirrels, Abert’s squirrels, red squirrel and the northern and southern flying squirrels. Part 2: Varmints with Bushy Tails! The squirrels that reside on our property seem to know a ‘new math.’ Every time one of these tree rats bites the dust, two more seem to arrive to join the game! I hate to admit it but we seem to be losing the race to control our pecan trees & yard. Most of the time, the squirrels run around our yard in fearless glee! I’m afraid they’ve found out about the “gutless wonder” that resides within. It’s so unfair…. However, from late September to early March, Richard is running marathons around the state of Texas. That means that he is not assisting the dogs to thin out the rodent ranks in our yard. The dogs get so caught up in their chase that they call to me (in true desperation) — to hurry out with the pellet gun. I have no problem bringing out the gun, I just have a problem loading and shooting it! One day, I was so tired of hearing the 3 dogs bark, bark, barking for the pellet gun that I went outside with pellets and gun – in tow. After several minutes of trying to figure out why the pellet wouldn’t fit into the proper place, I called Richard at work. He groaned. A lot. After giving me minute directions, that didn’t seem to make sense, MDH*suggested I wait till he got home. I told him I’d happily wait but I didn’t think the squirrel would (wait around). I was right! The good news is that I finally wedged the pellet in the gun. The bad news is that was not in the right place and it took MDH about 20 minutes to extract the pellet from the unfortunate spot where I’d placed it. Through no fault of mine, the gun still works. The other half of the problem is that the gun has to be pumped – a lot. Actually, I think someone wanting to develop their biceps would be wise to take up pumping one of these things. I can do the first one. Period. I really struggle with the second one. But you know what really hurts? The squirrel I want to shoot stops and watches me. I think he’s laughing! Varmints with Bushy Tails You Can Shoot! It’s always “open season” for squirrels on our property. It’s fortunate that the state of Texas concurs – since that is where we live. Forty years ago, when we moved to this house and property, MDH* decided to create a pecan forest. During the bone-chilling times and the sweltering summers, Richard was out nurturing, grafting and pruning his baby trees. Where Do Squirrels Come From? We live on the coastal plain close to Galveston; squirrels were missing from our environment — in the early days. Salt, sand and clay soils were hardly what these varmints want when scoping out new digs. Richard will tell you that “tree rats” come from hell. Once his trees started to develop pecans, 24-hour-eating-machines took up residence in Richard’s pecan orchard. I know, you’re looking at that cute chipmunk/squirrel/tree rat above and have decided that we are greedy monsters, unwilling to share our bounty with these little frisky imps. Hah! These little vultures try to eat their weight in Richard’s pecans. They do not understand the concept of “portion control.” The photo above proves my point! Squirrels were moving into our trees at such a rapid rate that MDH decided serious action was needed. He called our three dogs (a Lab, a Chow and a Basset Hound) and promised a yummy meal for each squirrel they escorted to the next life. The race was on! The squirrels started eating more nuts to keep up their strength to evade the dogs below. As the trees grew to full size, the tree rats started showing our dogs what great tree jumpers and gliders they could be! True to his promise, Richard pulled out his pellet gun, after the dogs treed one of the fluffy tails, and helped the varmint to an early grave. Everyone seemed happy … and then …. Last September 13, the hurricane came across our property and tore out the tops and centers of the pecan trees. In spite of the devastation, there was a silver lining — there was no longer a full canopy overhead! Squirrels got the shock of their lives when they started to fly across to the next tree — and the branches were gone! Unfortunately, they quickly adjusted to the new reality!